A horse tram bound for either Hindmarsh or Henley Beach is seen on Hindley Street having started its journey in King William Street in 1903. Six years later, the horse trams would have been replaced with electric trams. King William Street c.1903 showing both single and double deck horse trams. The track in the middle of the photo turning right is for trams serving Hindley Street. 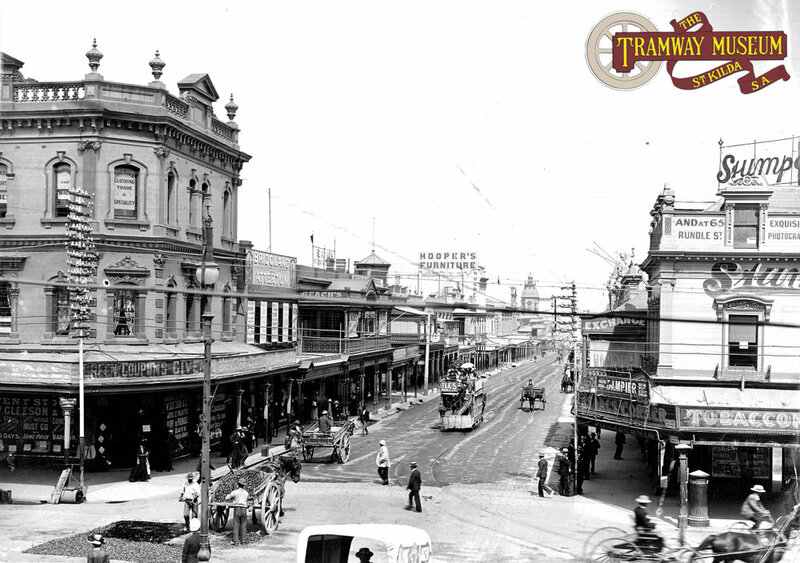 The very first street tramway in Australia was a short lived horse tramway running along Pitt Street in Sydney. This was however a short lived operation, only running for six years between 1861 and 1866. Adelaide was the first Australian City to have a permanent tramway system when the Adelaide and Suburban Tramway Company opened a line running from the City to Kensington. Unlike most of the other tramway systems that were to open in Australia, the Adelaide horse tramway system was developed by a number of private companies. A standard Adelaide and Suburban Tramway Company double deck horse tram passing the City Baths (now the site of the ADELAIDE Festival Centre) on King William Road. The first horse trams came from John Stephenson and Co, New York, but in later years they were built in Adelaide by Duncan & Fraser and by the Adelaide and Suburban Tramway Company 'in house'. Stephenson cars included “builder’s plates” in ceiling windows. The Parkside Company differed in having four fully imported Belgian trams – two open and two closed. Most of these trams were designed to be hauled by two horses although the largest horse trams were hauled by three, especially when going up and down hills. By the time the horse tramway companies were acquired by the Municipal Tramways Trust in 1907, the combined horse tram fleet included 162 trams and 1056 horses. Most of the horse trams used in Adelaide were double deck vehicles with an enclosed saloon at the bottom and an open top deck. Most of the top decks were covered with a canvas awning although the trams running to Henley Beach were not so fitted for fear that a sea breeze would blow a tram over and on to its side! A fundraising event was held at Adelaide Oval during the First World War to help look after the soldiers who had gone to the front. One of the main acts was the staged collision of two redundant horse trams on the oval before setting them on fire. Although they were modern at the time they were introduced, the horse system in Adelaide soon became outdated. The opening of steam tramways in Sydney and cable tramways followed by Australia's first electric tramway in Melbourne by the end of the 1880s showed how far tramway technology had advanced. By the dawn of the 20th Century, Adelaide was the last capital city in Australia to still make the conversion to electric tramways. It became desirable to convert the tramways to electric operation but it became clear that none of the horse tramway companies were in any position to make the conversion themselves (the Adelaide & Hindmarsh Tramway Company had never paid a dividend through out its operating life). Several schemes were put forward to convert the system but it wasn't until 1906 that an Act was passed bringing in to being the Municipal Tramways Trust. Set up representing the various local councils and the State Government, the Trust purchased all of the private companies in 1907 with the first electric tram services commencing in 1909. By 1914, the last horse tram in the City ran to Clarence Park.